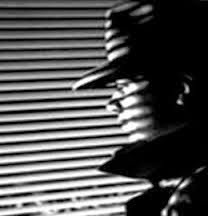 Joe Diago sat back in his cushy office chair, pushed his hat back on his head - the same as his P.I. cousin down the hall as they shopped at the same hat store - and stared at the ceiling fan while listening to it making it's whoop, whoop sound as it pushed down the cool air, what little cool air there was. The constant swish of the blades made him dreary and he fought to keep his eyes open. Things were slow in the Private Eye business lately and if something didn't come along soon that fan wouldn't be spinning around anymore because he'd not have been able to pay his electricity bill. What was that ringing in his ears? He'd drifted off and hadn't realized the telephone was chirping. It was an unusual sound as he hadn't heard it in weeks and almost forgot that destinctive trill of the telephone. Diago looked at the dial. "Diago Detective Agency" he spoke into the receiver, though very few knew the "agency" consisted of Detective Diago. "Yes, hello. This is Donna. Donna Diablo and I need your help Detective Diago." "Well, if I do that this bit won't work, Diago." "Oh, I see, yes. Continue Mrs. Diable." "Well, Diago something diabolical has happened. Someone has stolen my diamonds. "Your diamonds, Diablo? That's something worthy of my unique investigative diagnosis!" "Well, I'd appreciate your diagnosis because losing my faux Lady Diana diamonds has given my husband considerable concern. You should have heard the diatribe he unleashed on me last night. We couldn't even have a decent dialogue." "I'm beside myself Detective Diago. I haven't slept, I have diarrhea and my diabetes is through the roof. Not to mention my diaphragm keeps popping out. I won't rest until this diabolical business is put to rest? "Gosh you sound as though you'll be in diapers soon, Mrs Diablo." "Do you need a diagram of where the diamonds were kept." "Actually because we live in a diaspora I'm confident this won't take long. And with a "dia"lect like yours Mrs Diablo I'm sure we'll succeed." The prompt this week from the folks at Studio30+ was dialect. I took some liberties. Just relieved to have gotten through this without seeing Dianetics. I was sure it was coming. Sorry to launch in to such a diatribe. Glad you enjoyed it. Damn, I knew I'd forgotten something. I loved that dyadic exchange! Oh my such a big word. Glad you enjoyed it Katy. You took 'some' liberties? Dear lord, you're rushing the diachrony of linguistics more than a wee bit which is going to put a real crimp in further dialogues between Anglophones and Francophones. No danger of a crimp. We have our language peculiarities to entertain us. I'm a little surprised there weren't any diacritical marks in this dialogue. Do you know how hard it is to find words that start with "dis"? And you went and found another one.